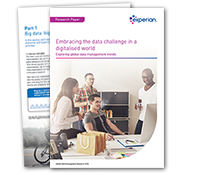 Our latest research explores how big data is fuelling business strategy and creating business opportunities. This, however, is set against a climate that’s more challenging than ever, where the explosion of data and new regulation means that the organisations managing it have extra responsibility. This is especially true given that much of this growing avalanche of information is created by individuals, it’s their data, but we are responsible for keeping it safe and using it appropriately. Our report gives a fascinating insight into how well organisations are responding to this ever-changing and complex data landscape, particularly those impacted by impending regulation. Discover how the latest global trends are affecting your business today.